We've had everything from below freezing temperatures to balmy spring-like days this winter. People running in shorts along the Lakefront in December. Crowds walking and riding bikes last Friday when the temperatures soared near 60. Me actually running in January--and not on the treadmill. Trust me, this never happens. 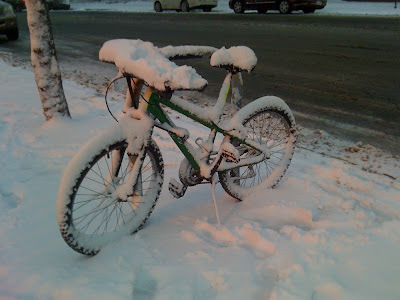 But if look out the window today, snow is falling from the sky, not just leaving a dusting like it did at New Year's but layering the ground enough to freak out drivers, delay flights and leave the bikes on the racks. I'm glad I'm not the owner of this bike. What a mess to dig out! But that's winter, right?